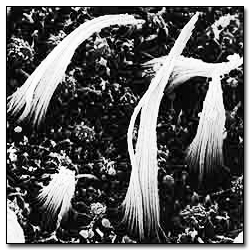 The vestibular hair cells of the utricular and saccular maculae and the ampullary crests of the semicircular canals are mechanoreceptors. Their cilia, located at the upper pole of the cell, are composed of a single kinocilium at the edge of a cluster of stereociliae. They bend under the effect of movement of the structures that surround them, namely the cupula of the ampullary cresta and the otolithic membrane of the macula. Linear acceleration triggers stimulation of the hair cells of the maculae, while angular accelerations stimulate the hair cells of the ampullary crests. Their incredibly elaborate movements are generated by a system of contractile proteins: actin, myosin and tropomyosin. At the lower pole, the hair cells have vesicles that contain the neurotransmitters responsible for the transduction of messages. 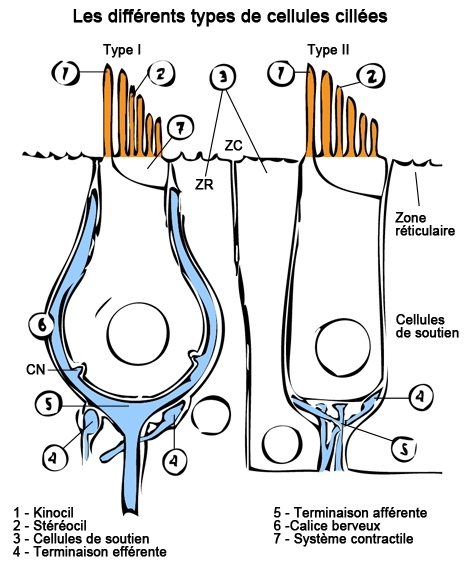 Type I cells have the particularity of being surrounded by a nerve calyx that encloses the whole cell and captures sensory information along the whole of its surface. It rests on the sensory epithelium, by way of the cilia of the hair cells of the macula that penetrate the small openings on the basal surface. It is composed of an essential gelatinous substance containing a cluster of fibrils. It is fifty microns thick with a 1mm2 surface area. Its surface layer contains otoliths, microscopic inorganic crystal primarily composed of calcium carbonate called aragonite. They are usually cylindrical in shape with three-face pyramidal tips. Their size varies from one to twenty microns, the largest of which are located to the edge of each macula. Otoliths seem to appear during the early stages of foetal development. Over time, under the effects of certain drugs or pathologies, they can be demineralised and their configuration may be changed. Lacking cellular elements, gelatinous and slightly opaque, the cupula is primarily composed of proteins and mucopolysaccharides. It rests on the ampullary crest of the semi-circular canals and is home to the bulk of the ciliary systems. It completely blocks lumina from the membranous canal.